Chrysler claims to be the creator of the minivan segment, something that Volkswagen may take issue with. Years before the 1983 debut of the Plymouth Voyager and Dodge Caravan, Volkswagen had the Type 2, what Americans called the Microbus or simply Bus. Regardless of what either manufacturer claims, the Chrysler minivans did change the market and in a way that Volkswagen never did. Indeed, when the first two models rolled out, it forever changed the way that people look at vans and people movers in general. With the advent of the minivan, the tired station wagon was assured its demise and larger families no longer had to resort to opting for the bulky and inefficient vans sold by GM, Ford and Chrysler. Yesterday’s minivans were based on the K-car platform, one of several model lines Chrysler used to power its cars in the 1980s. Those vans were truly “mini” in proportion and powered by four cylinder engines. Today’s vans have largely dropped the mini appellation as they’ve grown bigger and heavier over the years. The V-6 engine is the common choice for these vans, a market that has been eclipsed by crossover utility vehicles. The 30th anniversary edition Dodge Grand Caravan. To mark its 30th minivan anniversary, the Chrysler Group announced in Sept. that it would release special anniversary editions of its current models. Both the Chrysler Town & Country and the Dodge Grand Caravan will be available in 30th anniversary editions, models that feature unique content including special paint, black interior trim and commemorative badging. Chrysler will base the 30th anniversary Chrysler Town & Country on its Touring-L model. That includes the 3.6-liter V-6 engine used across the model line and its accompanying six-speed automatic transmission. These models will be outfitted with 17-inch aluminum wheels with polished faces and satin carbon pockets, and an available Granite Crystal Pearl Coat paint. Inside, the anniversary edition Town & Country are black Alcantara seat inserts with Nappa seat bolsters, updated steering wheel and instrument panel trim, a power folding third-row seat and the Driver’s Convenience Group. That group includes heated first- and second-row seating, keyless entry, power adjustable pedals and bright door handles. You will also get power folding side mirrors. 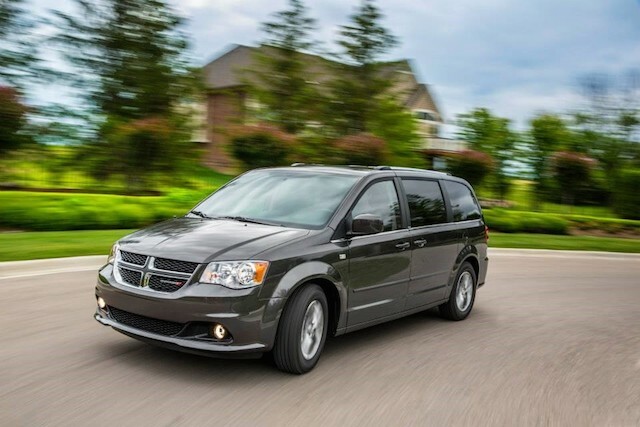 For the Dodge Grand Caravan, the special edition package will be available with both the SE and SXT trim levels. Corresponding interior and exterior enhancements found on the Town & Country will be available here and will also include the Uconnect Handsfree Group with a one-year SiriusXM Satellite Radio subscription, Bluetooth streaming audio and voice command, and an auto-dimming rear view mirror. Grand Caravan SXT models step things up with fog lamps, automatic headlights, leatherette seats, a 10-way power driver’s seat and the appropriate badging. Bright work trim embellishments will further distinguish this model from the SE. Besides it claim to being the first producer of minivans, Chrysler says that it has sold twice as many models than any other manufacturer, selling more than 13 million units to date. Chrysler claims a number of firsts too including its patented “Stow ‘n Go” seating and Blu-ray rear-seat entertainment system. As always, Chrysler’s minivans have been built in Windsor, Ontario, it sole supplier to the world. How many iterations of the Chrysler’s minivans have there been? Following the Plymouth Voyager and Dodge Caravan, extended wheelbase models were named Grand Voyager and Grand Caravan respectively. The Chrysler Town & Country came later and when Plymouth folded, the Voyager was sold as Chrysler briefly before being dropped. The Volkswagen Routan is another model, produced for the German manufacturer for four model years ending in 2012. That makes seven models for North America and eight total if you include the Lancia Grand Voyager.